Welcome to summer! The entire nation has warmed up and most outdoorsmen are looking to have some fun catching some bass at their favorite pond. The real trick is knowing how to fish these incredibly productive waters and today's article will tackle some of the keys to accomplishing this favorite summer ritual. How many rods do I need? Everyone has watched the pro fisherman standing on their gigantic casting decks with no less than 10 rods at the ready. I have great news. You really only need 2 rods to cover almost every situation you may face in at a pond. I use the same type of medium action rod and reel combo but rigged very differently. On one rod, I am going to tie a snap so that I can change out baits quickly. On the other rod, I like to always have some type of soft plastic tied on whether it be a fluke type swim bait or a plastic worm. With these two basic set ups, I can quickly switch if the situation calls. For more on rod selection Click Here. How quiet should I be? Fish have a lateral line on the sides of their bodies that are very sensitive to vibration. Before I move down a bank, I am sure to fish in the direction I am about travel. Once, I have fished it, I then move slowly in my wheelchair. I am careful to be watching for any fish they may sense my movement that could be laying close to the bank. After watching monster fish swim away, you will learn to be patient and move slow. One key point to remember when fishing a pond is that feeding fish are always moving. I have sat in one spot and watched three different fish weighing in excess of 4lbs swim right by me. Because I had not moved, they came to me. All to often with a good cast out in front of these cruising fish, I catch them. One last thought on movement. I like to wear a shirt that matches the sky on that particular day. If it's cloudy I like to wear white or grey. If I am dodging trees, I like to wear green or camo. Bass have very good eyesight and every little edge helps. What type of cover should I key on? 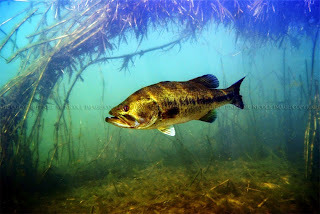 Bass are cover-centric animals. As the water warms and the summer gets hot, they are going to find shade. Shade for a bass does provide some relief from the hot sun but more importantly gives them the ability to hunt with stealth. Shade can be anything from a dock, to grass, to lily pads. I once caught 6 fish from under one dock in about 15 minutes. It was around 98 degrees that day. 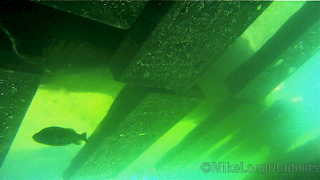 When fishing a pier or dock, be sure to make many casts to it before getting on it. Fallen natural trees or submerged Christmas trees are golden! If a pond doesn't have shallow cover, Bass will look for the deepest water near a flat that holds bait fish. "Deep" is one of those words that depends on who is talking. To a fish, just a 2-3 foot depth change can be drastic. 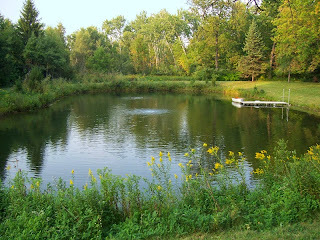 Especially since most ponds are rarely deeper than 8-12 feet. Sometimes an entry ditch or creek that is just a few feet or even inches deeper can be all the depth change necessary to hold fish. What types of baits should I use? Any bait I have used in a lake, I will throw in a pond with the exception of a deep diving crank bait. I like to use shallow running square billed crank baits when pond fishing because they come through wood type cover better without getting hung up as bad. 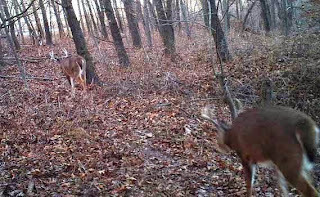 As May turns into June and the early summer begins to heat up, this is the time of the year to make the drastic changes you thought about last November to your hunting spot. Being in a wheelchair can add an extra dimension of strategy. It also can give you an edge when executed correctly that can pay off big come October. The place where I hunt has a small pasture. Once you pass through a secondary gate there is another small pasture with dotted oaks. This is where we have planted a clover food plot. The second pasture then gives way to full fledged forest. Last season, I made a mistake that I am confessing now so that you can learn from my transgressions and be a step ahead of me. Only cut what is necessary! 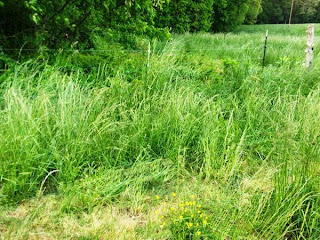 In order to get my chair through the pastures, which had 3-4 foot hay growing in it, we cut trails. The problem was that we were too aggressive in what we cut. We complicated that mistake even further by cutting them too close to the opening day of the season. The deer were using that tall grass as cover. It never had a chance to recover and I probably missed out on some deer because of this. Truth is, I got a late start in determining where I was going to hunt and in turn began to cut these trails in August which was too close to the opening of the season. Your activity will rarely bother deer so long as you leave enough time for your presence to fade away. Remember, deer are creatures of habit. Now I am no deer psychologist but, a habit takes about 21 days to establish in a human let alone a deer. Last year we made a mistake. This season we will leave the tall hay everywhere except the exact paths necessary for entrance and exit. We will likely add in shooting lanes if necessary by about late July. We did, however discover something after making the cuts and I will come back to this in just a bit. 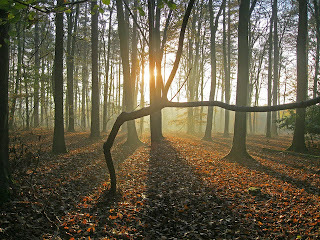 Once we got past the field where the forest began, we ran into an entirely different set of challenges. 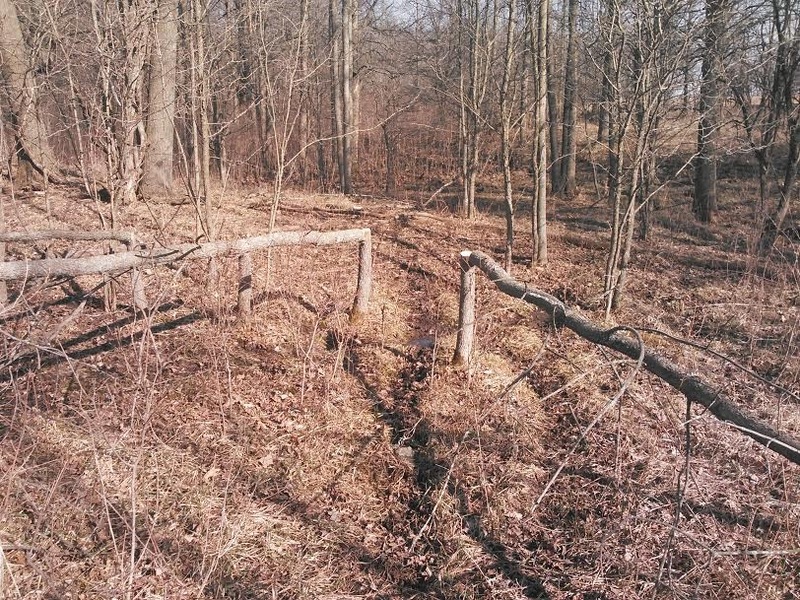 There were old trees that had fallen and logs littered the property. It made it difficult for me to get in and out and let's not mention trying to be quiet. This season however, we are going to use those same obstacles to bring the deer to me. Deer, like any other animal, only want to exert the energy necessary to do whatever is on their minds. This means they will walk a decent distance to go through an open gate instead of jumping a fence. 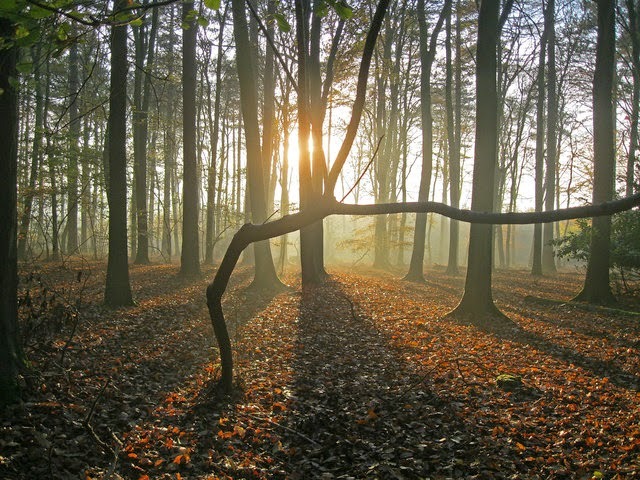 Although they do walk on defined trails, they also have a tendency to go a little willy-nilly through an area. 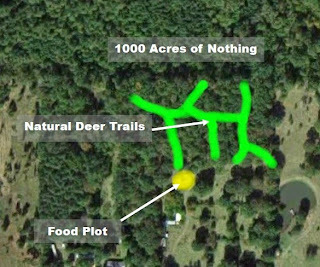 Last season, we cut a couple of paths into the forest area and immediately noticed deer sign on these paths as well as in the high grass. 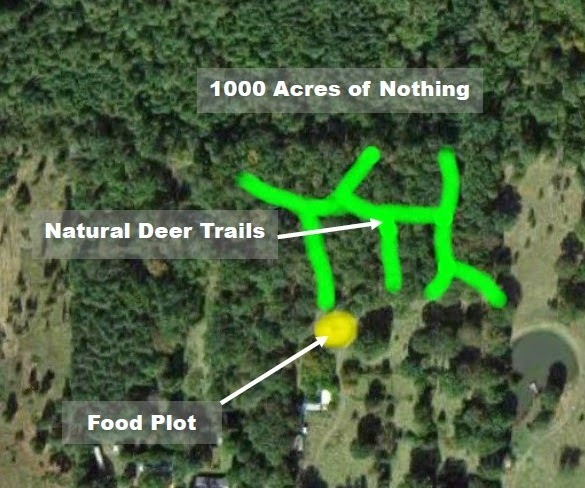 The same trails we created so that my wheelchair could enter and exit easily became valuable highways to the deer also. All those logs can be obstacles or resources. 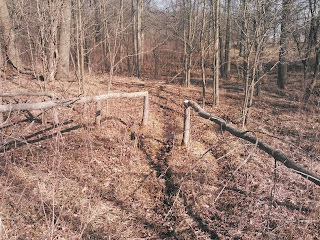 This summer we are taking those old downed trees and will arrange them to create choke points in order to concentrate deer movement leading to the food plots and other natural forage. 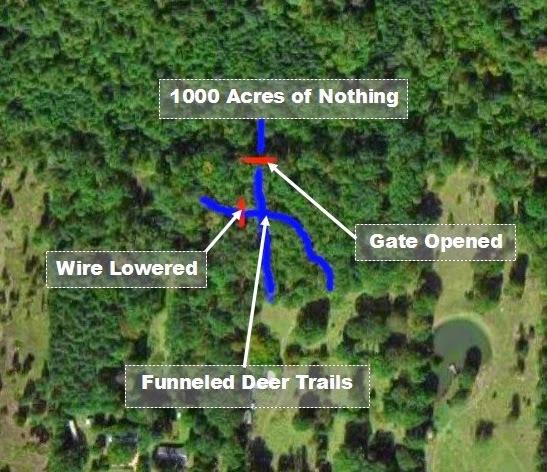 On top of this, we are opening a gate in the back corner of the property and making the barbed wire lower in a couple of spots that the deer are jumping the fence. All of this will help them to not have trail A.D.D. and will funnel them to my desired locations. Taking these simple steps will give me a much better chance to encounter the deer I/you are targeting. I want to emphasize that we are doing all of this now so that the deer have plenty of time to become acclimated to their new walk-ways. I want them to associate any activity by us to mean new mineral blocks, fresh food, goodies in the feeder, etc. We even like to place our hunting blinds out by early August so that there are a good number of days for them to get accustomed to those too. More on this line of thinking in a future article I promise! Many outdoorsmen will confess that their time spent in the woods or on the water is sacred. I am not talking about sacred in the figurative sense either. There is an ethereal quality in the isolation of the wild where the created becomes one with the Creator. It is in such cathedrals that the voice of God can be heard clearer than at many impressive church buildings. Instead of hearing the voices of hundreds and even thousands, the silence of the wild can make God's voice that much clearer and louder. In 2012, it was on just such an occasion that Jeff Warren found himself in God's place. Jeff is an avid hunter. Even confessing that he loves to hunt so much that it might be like...a problem. Maybe. Maybe not! Jeff had been hunting a massive buck for much of the season in 2011. He spent as much time in the woods as possible to encounter this trophy white tail. It was on one such day that God showed up instead of the deer. Jeff was eyeing the tree-line when out of the blue he hears in his heart, "When will you hunt for others?" Ummm, what? Others? He knew he wasn't thinking this up. Being a pastor, he is familiar with hearing the voice of God in his life. But he had no idea what to do with the question. So, he did what any other person has done through the ages...nothing. The next season he again was on the trail of another great buck, when he hears yet again the same question from the same source. Jeff got serious and began asking some questions back. After praying and fasting for two weeks, he received the vision and even the name which is now The Dream Hunt Foundation. God laid it all out for him - "Take kids hunting who may never get that chance." Jeff knew what God had told him to do but didn't have the first clue as to where to start. How do you create waves in an arena where you don't know any of the people? Again, he asked God about this. God's response - "I know all of them." He mentioned all of this to his Pastor who said, "Yep, I know who you need to talk to." Jeff was given a meeting at Shriners Hospital in Shreveport, LA. The hospital helps kids with all sorts of physical limitations. He had no idea that his first meeting was going to be with a bunch of V.I.P. 's at this incredible facility. Everyone else were wearing suits and ties while Jeff walks in with a camo shirt and jeans. Didn't matter, after they listened to his heart and vision, they immediately gave him the names of five kids. In the first year, DHF took four kids deer hunting and one duck hunting. Other hospitals and organizations began hearing about this and they too sent Jeff kids. In 2014, DHF took 25 young people deer hunting, one duck hunting and 15 fishing. The man who once was nervous he wouldn't be able to make any waves in this arena is now attempting to handle tsunamis. In 2015, DHF has taken 19 kids fishing this spring and will take another 15 later this month. Over 100 dream hunts are already planned and waiting for the season to open. Along with Shriners Hospital, Jeff is now sought after by St. Jude Children's Hospital (Shreveport Clinic), the Baptist Children’s Home in Monroe, Louisiana, Pay It Forward Networking, LSU Medical Center, not to mention word of mouth where people just pick up the phone and make a call. He is even getting calls from surrounding states to take a children hunting. This coming fall he has two Dream Hunt Weekends planned where 20 kids, 20 landowners, 20 guides and 20 cameramen will all meet up, eat breakfast and then head with their landowner to hunt. After their hunt, they will come back for lunch to tell their stories, laugh, fish and skin deer. How cool is that? Knowing that none of this happens just by accident, I asked Jeff what is the average cost that goes into a typical hunt? DHF does it right. Every hunt is guided and filmed. Landowners donate time on their places which helps tremendously but equipment, guns, ammo, ect. must be purchased or donated somehow. BassPro Shops is a sponsor and still each hunt runs about $500 to make it the hunt of a lifetime. I asked him how a kid gets selected for a hunt. His answer blew me away. Apart from having to have a terminal illness or affected by a disease that a hunt would not be a normal activity, every kid goes! He had an adviser tell him once that he had to begin telling kids no so as to control the growth. His response was priceless - "That's fine. You be the one to call and tell that kid they have been turned down." It's because of a great big heart in this great big man that businesses are sponsoring hunts left and right for DHF. To date, not one child has been turned down due to money. If you would like to sponsor a hunt, give Jeff a call or en email from the Dream Hunt Foundation website. If you know a young person ages 8-18 who fits the criteria and wants to hunt or fish, the application can be downloaded Here. You might ask, "Doesn't the Make A Wish Foundation do this?" The answer is NO! Make A Wish does an amazing job however, they will not grant a young person any adventure that involves a firearm. Thanks to The Dream Hunt Foundation for filling a void and giving some young people the thrill of a lifetime. One of the fun things you get to do when hosting your very own outdoor blog is test stuff out. 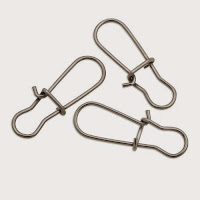 I am constantly scouring the Internet to try and find the neatest things that might be able to help someone get back into the field or on the water. Last fall, I ran across a unique concept and wanted to try it out from a handicapped/disabled perspective. The results have been amazing! The Fishing Arm Anchor was invented by Trent Oldham. It was originally devised to aid tournament fisherman. Kevin Van Dam makes about two casts per minute during an 8-hour competition day. This equals roughly 28,800 cast in a typical year for KVD. We haven't even begun to add in practice days, bait testing, etc. You can imagine the fatigue a pro goes through. The Fishing Arm Anchor helps a fisherman to remain fresh throughout the day by adding some leverage onto their rod and taking some of the stress and fatigue off their arms and hands. It's a simple design and can be configured for either the right or left hand. It also is made to fit any style rod whether baitcasting or spinning. In fact, I was using it completely backwards to the instructions at one point this spring just because it felt better to me. What's the advantage? I thought you'd never ask. I was able to do something with this little addition to my rod that I haven't been able to do in many years. After setting the hook, I was able to bring the rod tip to a 12 o'clock position...repeatedly. The little arm extends out from your rod at a 90 degree angle and allows you to catch your forearm or elbow to give you greater control and strength to raise the rod into a much better fighting position. 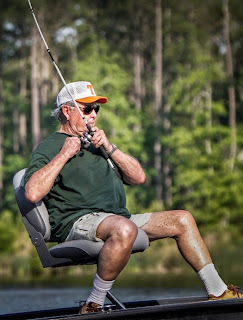 In all of my years watching professional fisherman set the hook, no one does it better than Bill Dance. Sitting in his chair, just like many of us, he generates a lot of kinetic energy. Much of that is due to his rod position and hand placement. He always brings his hands to his chest with the rod tip up creating enormous leverage on the fish. The rod tip being up also helps fight a fish that decides to run directly at you. By bringing the rod tip to the 12 o'clock position, you can chew up precious feet of line to keep a fish on that might shake loose if your rod is pointing at the horizon. Frankly, this position has become increasingly more difficult for me to achieve due to muscle loss over the years. However, this spring, the Fishing Arm Anchor enabled me to produce glorious hook sets and achieve this coveted rod position. I even had one fish do the nasty move of running toward me. For the first time in many years, I caught myself naturally bringing the rod tip up, negating the fishes surge and keeping him firmly on the line. On a different note, I want to give a great big shout out to two new sponsors. BassPro Shops and Long Range Alley have graciously partnered with Handicapped Outdoors and are aiding the cause of getting the handicapped and disabled back into the field and on the water! Thanks a ton for your support!